Author : Donatien BERTAUD. Translated by : Uriel N’GBATONGO. In Asia due to the rise of regional powers which are trying to get a worldwide influence the military forces are being profoundly modernized. In the aftermath of the XIXth the Chinese Communist Party congress, the president XI Jinping reaffirmed his will to build of world-class Chinese army by 2050. Thus, creating a powerful army capable of shouldering China as a major power and capable of facing the challenges of modern warfare as well as the rise of many rivals. As we can see on the second graph, there has been a fast growth of the Asian military budget, partially due to the Indian and Chinese power. China turned its back at the idea of keeping a low profile, thinking that its momentum has come. As for India, nowadays it is increasingly galvanized by nationalism. Hence, in front of the increasing influence of China, and its vague desire in the Pakistanis region, India is trying to build a modern army capable of facing any potential rival (that is to say China and Pakistan, a state with which its diplomatic relations have always been complicated). The nationalist influence is not only active in India but also in China where officials are now willing to bury definitively the « century of the shame » and to see being reborn the Middle Kingdom. These current tendencies also affect Japan where nationalists wish to see a revision of the national Constitution and to modernize the Japanese self-defense equipment. As a consequence, the increasing ambition of these armies is pulling a chain reaction. Other states, for fear of being exceeded by these armies which are to be far more important by around thirty years, have tried to strengthen their own military forces. This chain reaction was introduced by China and India. As for India, it wishes to have a decisive political role concerning the South Asian region and to establish its dominion over the Indian Ocean so as to become again the Indian’s ocean. As for China, it wishes to become the next counter power against the United States and to develop an army which would be more suited to its current economic and politic power and influence. Nevertheless, a good strategy does not serve only one objective. This increasing military power actually serves economic, technologic and military, power too. Indeed, this modernization of the army of both countries, among the most populated one, is a mean to assure the safety of their maritime supply routes. Having open their economy and integrate globalization, China and India are now dependent of their maritime borders. Their economy is now supported by their exportation but also by the supply of foreign raw materials they receive. Is this observation is less true for India, China has recognized for a long time the problem and has tried to solve it by adding a military approach to the protection of the new silk road. In order to defend its maritime supply routes India and China are basing their respective military investment on the navy. Indeed, ships and submarines are also for these two countries to the challenges put by modern war. 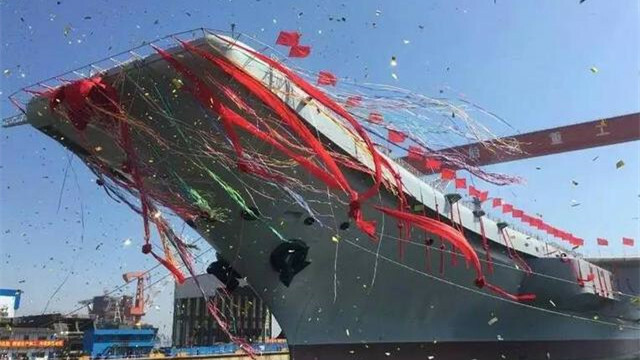 The launch of the second Chinese aircraft carrier (2), this one takes part of the « two ocean strategy » (3), developed by Xi Jinping, which consist in building a navy that is deployable farther inland. Having capacities of deployment in deep water this navy can insure the safety of the worldwide Chinese supply routes and meet the requirement of the « two ocean strategy » which aim at setting up the Chinese army in both the Pacific and Indian Ocean. This aircraft carrier thus answers many Chinese objectives. First of all, it gives to China a worldwide projection capacity, then it allows governments to defend their economic and politic interests. However, a single aircraft carrier is not enough to be effective. That is why the Chinese government is also trying to acquire battleships and corvettes shape a whole new army. It is also important to note that this aircraft carrier has been produced locally. Thus, meaning that China does only increase its equipment but also develops a military production and maintenance capacity. Experts among whom certain members of the CSIS (Center for Strategic and International Studies) emitted doubts as for the quality of this aircraft carrier. It turns out that the Chinese aircraft carrier is technologically comparable to a modern aircraft carrier or at least compounds elements which build the power of these war machines such as the electromagnetic catapult (4). This point is important as it shows the technological capacity of the Chinese shipyard. Indeed, this aircraft carrier can embark more planes, ammunitions, fuel, and spare parts than average one. As for India, it is longing at developing a modern aircraft carrier locally produced too. This one would benefit from the same system of electromagnetic catapult and nuclear propulsion but will not be ready before 2030 according to the national government forecasts (5). In front of this increase of the naval strength, the various regional actors have decided to develop fighting fleets and air-to-surface missiles. These missiles would allow to pour or to damage significantly vessels admirals such as aircraft carriers, reducing largely the fire power of the fleet which accompanies them (6). Furthermore, they are one of the mort essential elements for a denial of access strategy. This strategy aims at forbidding the access to a delimited zone considered as strategic by the installation of a blockade, an artillery or thanks to a striking force nearby which would possibly neutralize and impede the deployment of a rival army in this zone. Such a defensive strategy can insure a country an influence over a zone in which they can control the access as the leading stakeholder or at least a stakeholder whom it will be necessary to include during the discussions about these strategic maritime zones. The development of a strong Navy also needs the building of submarines that India and China want to be able to produce indigenously. (6) China is already part way on this as we have seen with the fusion of two shipyard in order to create one of the largest Chinese processing plant for submarine (7), and with the restart of the construction of Chinese stealth submarine. (8) India has commissioned submarines to the French constructor Naval Group (former DCNS), which gave the plans to the Indian government and proceed to the construction of those in India according to the technology transfer contract, which was firmed between the two actors. (6) Those submarines will allow the creation of a force able to break open a blockade, threaten important channel of supply and pose a tangible threat on both military and civilian fleet sailing on the same waterways. Furthermore, those submarines are often equipped with SLBM (submarine launched ballistic missile) which means that they are part of the nuclear deterrence forces of the country they belong to. This capacity of deterrence is one of the key element of a significant military power. It offers a much larger importance on the international scene. If China and India possess nuclear weapon respectively since 1964 and 1974, those submarines bring with them a new element: a second-strike capability. Indeed, this second-strike capability is an essential element of nuclear deterrence for it allows a country to reduce the benefits of a preventive strike because even if this strike were to reach its aim neutralizing part of the arsenal of an adverse country, the aforementioned one will still be able to strike back with nuclear weapons launched from those submarines. Moreover, the interest of those submarines doesn’t limit to those nuclear strike. They also allow the use of SLBM in order to neutralize strategic targets. It doesn’t stop here states also develop their capacity to fight against submarine either by building or commissioning ship to this effect, or placing submarine sensors which would allow the surveillance of the main submarine waterways or even staging large anti-submarine warfare exercises. This fight against submarines also consider the acquisition of airborne means of detection such as planes or helicopters. This modernization is far from reaching only the Navy but has also an impact on air forces which are playing a capital role in the projection capacity. Indeed, they allow the rapid deployment of airborne infantry, a deterrence capacity with strategic bombers, and a capacity of denial of access due to the fact that those planes are the one carrying air to surface missile and are the more able to close in on carrier strike group. Air forces are an element all the more important that they allow to provide an aerial support to troops on the ground and to intervene in conflict without deploying infantry but only by offering this support which mainly depends on the projection ability of those different countries. It is interesting to see that military aviation is nowadays approaching a turning point because the replacement of the actual fighter generation is right at the corner. Effectively, military technologies are characterized by their long research phases and even longer phases of deployment for sky high prices. The new generation of fighter jets is now being lead by planes such as the US F-35 and in Asia by the Chinese J-20. The J-20 is a “stealth” fighter jet indigenously produced (“stealth” because this element has been put to doubt by experts). For its parts India has joined a project with Russia in order to develop an equivalent fighter jet but disagreements are retarding the project. The technology behind those fighter jets would allow the two countries to possess weapons equivalent to the one of the most modern armies. This may also allow them to get a technic know-how in the domain of planes production which might be useful in the civilian industry because China aims to create its own civilian planes with the COMAC (Chinese SOE for plane production). Therefore, by developing this technology the two counties can hope for important economic fallout in the civilian industry while getting a high-end military and assuring local production capacities. Finally, it is necessary to consider the fact that China and India while aiming for a modern military are not neglecting the rise of new aspects of conflicts and the new spaces which they encompass such as: cyberspace and space. The forms of this consideration have been ambitious reforms put in place by the Chinese government to develop a cyber expertise (10) and the creation of missiles able to destroy satellites as Beijing as shown us with the destruction of one of its own. We have seen a modernization of the most important armies in Asia the movement has been spearheaded by China and India the two giants and has now spread to neighboring countries. L’Asie du fait de la montée de grandes puissances régionales qui cherchent à acquérir une influence mondiale connait actuellement une modernisation en profondeur de ses forces armées. Budget militaire en $ Us constant base 2015, Source Sipri. A l’issue du XIXème congrès du Parti Communiste Chinois le président Xi Jinping a réaffirmé son ambition de faire de l’armée chinoise une armée de classe mondiale d’ici 2050. Qu’entend-il par-là ? Une armée puissante capable d’aider la Chine à assumer son rôle de grande puissance et qui puisse faire face aux défis de la guerre moderne ainsi qu’à la montée de potentiels rivaux. C’est d’ailleurs suivants ces points que nous tacherons d’expliquer la montée en puissance des armées asiatiques que nous connaissons actuellement. En effet comme il est possible de le voir sur le second graphique l’Asie a connu une rapide croissance des budgets militaires une croissance bien plus rapide que les budgets militaires mondiaux. Cela est dû en partie à l’affirmation de la puissance indienne et chinoise. La Chine a tourné le dos à l’idée de faire profil bas en attendant son heure défendue par Deng Xiaoping (1) peut-être parce qu’elle estime que cette heure est arrivée. L’Inde quant à elle, galvanisée par le nationalisme sous-jacent dans sa société et face à l’importance croissante de la Chine et les velléités militaires du Pakistan, tente d’équiper son armée de moyens modernes afin de pouvoir faire face à un potentiel concurrent : la Chine et un état avec lequel les relations ont toujours été compliquées. L’influence des nationalistes sur l’armée n’est pas seulement présente en Inde mais aussi en Chine ou ceux-ci souhaitent enterrer définitivement le siècle de la honte et voir renaître l’empire du milieu. Ces courants touchent de même le Japon où les nationalistes souhaitent voir la constitution révisée et moderniser l’équipement des forces d’autodéfense japonaises. La montée en puissance de ces armées entraine une réaction en chaine. Les autres états, de peur d’être dépassés ou ne serait-ce que pour pouvoir faire face à ces armées qui s’annoncent à une toute autre échelle d’ici une trentaine d’année, essayent eux aussi de moderniser leurs forces militaires. Cette réaction en chaine fut initiée par la Chine et l’Inde. L’Inde souhaite pouvoir jouer un rôle politique important dans la région et établir son dominion sur l’Océan indien pour qu’il redevienne l’océan des indiens. La Chine souhaite de son côté devenir le nouveau contre poids à la puissance militaire américaine et développer une armée qui siérait à sa puissance économique actuelle et celle qu’elle souhaiterait avoir dans le futur. Ainsi cette modernisation des armées est un argument de la Chine et l’Inde pour affirmer leur statut de puissance de premier plan. Mais une bonne stratégie ne sert pas qu’un objectif. Effectivement cette montée en puissance des armées indienne et chinoise sert des objectifs d’affirmation de puissance comme précédemment décrit mais aussi des objectifs économiques, technologiques, et purement militaires. En effet cette modernisation des armées des deux pays les plus peuplés du monde doit leur permettre entre autres d’assurer la sécurité de leurs voies d’approvisionnement maritimes. La Chine et l’Inde s’étant ouvertes et intégrées au commerce mondial, elles sont devenues de plus en plus dépendantes de celui-ci. Leurs économies sont soutenues par leurs exportations mais aussi par l’approvisionnement en matières premières qu’elles reçoivent de l’étranger. Si ceci est moins vrai pour l’Inde, la Chine a depuis longtemps reconnu le problème et essaye de le résoudre à l’aide d’une approche civile les nouvelles routes de la soie et d’une approche militaire. Afin de défendre ses voies d’approvisionnement maritimes l’Inde et la Chine centrent la modernisation de leurs armées sur la marine. Ainsi nous avons pu voir la commande, la construction et le développement d’un nombre conséquent d’éléments des flottes de combat de ces deux pays. Les navires et sous-marins développés et/ou construits sont aussi la réponse de ces deux pays aux défis posés par la guerre moderne. Ainsi nous avons pu voir le lancement du second porte-avion chinois (2) celui-ci s’inscrit dans la stratégie des deux océans (3) développée par le gouvernement de Xi Jinping qui consiste à faire de la marine chinoise une marine non plus côtière telle qu’elle l’est actuellement mais une marine d’eau profonde c’est-à-dire une marine déployable plus loin des côtes. Seule cette marine ayant des capacités de déploiement en eau profonde pourra assurer la sécurité des routes d’approvisionnement chinoises à travers le monde et répondre aux exigences de la stratégie des deux océans à savoir établir la présence de la marine chinoise dans l’océan pacifique puis indien. Ce porte-avion répond donc à de nombreuses exigences chinoises : tout d’abord il offre à la Chine une capacité de projection accrue cette capacité de projection est poursuivie par les plus grandes armées car elle permet à un gouvernement de défendre ses intérêts, ses idéaux et/ou valeurs sur tous les terrains d’opérations. Cependant un porte-avion seul ne suffit pas celui-ci doit en effet, pour être le plus efficace possible, être défendue par une flotte c’est pourquoi le gouvernement de Pékin cherche aussi à acquérir cuirassés et corvettes pour former cette flotte. Il est aussi important de noter que ce porte-avion a été produit localement ce qui signifie que la Chine ne fait pas que s’équiper mais qu’elle développe aussi une capacité de production et d’entretien autonome. Des experts parmi lesquels certains membres du CSIS (Center for Strategic and International Studies) émettaient des doutes quant à la qualité de ce porte-avion et s’il était comparable à un porte-avion « moderne ». Il s’avère que le porte avion chinois est technologiquement comparable à un porte-avion moderne ou du moins dispose d’éléments qui font la puissance de ces porte-avions tel que la catapulte électro-magnétique (4). Ce point est important car il démontre la capacité technologique des chantiers navals chinois et augmente significativement l’importance de ce porte-avion qui peut dès lors faire décoller des avions sur une piste beaucoup plus courte ce qui libère une grande capacité de stockage. Ce porte-avion peut donc embarquer à son bord plus d’avions, de munitions, de carburant, et de pièces détachées ce qui lui confère une capacité offensive accrue. De son côté l’Inde cherche elle aussi à développer un porte- avion moderne produit localement. Celui-ci bénéficierait du même système de catapulte électro-magnétique et d’une propulsion nucléaire mais ne sera pas prêt avant 2030 selon les prévisions du gouvernement (5). Face à cette augmentation de la puissance maritime de surface les différents acteurs régionaux réagissent soit en développant à leur tour une flotte de combat ou des missiles air-surface. Ces missiles permettraient de couler ou d’endommager significativement des vaisseaux amiraux tels que les porte-avions réduisant grandement la puissance de feu de la flotte qui les accompagne (6). De plus ils sont l’un des éléments essentiels de la capacité de déni d’accès de zone de ces forces armées. Le déni d’accès de zone est en partie la réponse à la capacité de projection des grandes puissances. Sur le papier l’idée est d’interdire l’accès à une zone considérée comme critique par l’installation d’un blocus, de batterie d’artillerie ou par l’existence d’une force de frappe à proximité qui viendrait neutraliser le déploiement d’une armée adverse dans cette zone ou rendre le coût de celui-ci bien plus important. Cela assure aux pays possédant cette capacité un contrôle sur la zone à laquelle ils peuvent bloquer l’accès faisant d’eux des acteurs majeurs de cette zone ou du moins des acteurs qu’il faudra inclure lors de discussions sur ces espaces. Cela ne s’arrête pas là les états développent aussi des capacités de lutte contre les sous-marins que ce soit par la construction de navires dédiés à cela, ou l’installation de balises radar sous-marines qui permettent de surveiller les principaux points de passages de ces sous-marins ou encore l’organisation d’exercices de lutte contre les sous-marins. Cette lutte contre les sous-marins passe aussi par l’acquisition de moyen aérien de détection. Cette modernisation est loin de se limiter à la marine mais touche aussi l’aviation qui joue un rôle essentiel dans la capacité de projection car elle permet de déployer rapidement des troupes aéroportées, dans la capacité de dissuasion avec les bombardiers stratégiques, la capacité de déni d’accès de zone car ce sont les avions qui portent les missiles air-surfaces et sont le plus à même d’approcher les flottes adverses. L’aviation est un enjeu d’autant plus important qu’elle permet d’apporter un appui feu aux forces déployées au sol mais aussi d’intervenir au sein d’un conflit sans déployer d’hommes sur le terrain mais en proposant uniquement cet appui feu qui repose principalement sur la capacité de projection que possède les différents états. Il est intéressant de voir que l’aviation militaire est aujourd’hui dans une phase charnière car nous approchons le renouvellement de la génération actuelle de chasseur. En effet les technologies militaires se caractérisent par des phases de recherche relativement longues et des phases de déploiement de cette technologie qui le sont plus encore le tout pour des coûts extrêmement importants. La nouvelle génération de chasseur est menée par des avions tel que le F-35 américain et le serait en Asie par le J-20 chinois. Le J-20 est un avion de combat « furtif » produit localement (« furtif » car sa furtivité a été remise en cause). De son côté l’Inde fait parti d’un projet joint avec la Russie pour développer un chasseur équivalent mais des dissensions retardent ce projet. La technologie derrière ces chasseurs permettrait aux deux pays de posséder des armes équivalentes aux armées les plus modernes de plus cela leur permettrait potentiellement d’acquérir un savoir faire technique en matière de production d’aéronefs qui pourrait être réemployé dans le civil puisque la Chine essaye de développer ses propre avions de transport civil au sein de la COMAC. Ainsi en développant cette technologie militaire les deux pays peuvent espérer des retombés économiques importantes dans le domaine civil tout en obtenant une technologie militaire de pointe et en assurant des capacités de production locales. Enfin il est nécessaire de voir que la Chine et l’Inde aspirant à une armée moderne ne négligent pas les nouveaux aspects de la conflictualité et surtout les nouveaux espaces qu’elle comprend : le cyberespace et l’espace. Nous avons ainsi pu voir des réformes ambitieuses mises en place par le gouvernement chinois pour développer une expertise cyber (10) ainsi que la création de missiles capables de détruire des satellites tel que Pékin a pu le démontrer en abattant l’un des siens. L’Asie voit donc se réformer les armées les plus importantes de la région se mouvement amorcé et largement mené par la Chine est suivi par l’Inde les deux géants faisant des émules dans les pays alentours. (1) France culture, Culture Monde du 13/11/17 et 15/11/17.